I must admit that some of the popular fashion dolls just don't sit right with me. I think they have just gotten a sterotype for being ditzy, pretty, dolls that don't model enough fortitude with young girls. Just my opinion. But these new dolls from Zeenie Dollz, now these are dolls I can stand behind! Each girl represents a mission, a goal to help save the planet and that is something that our little girls can enjoy modeling. Created for young girls and eco-conscious parents, the dolls are fashionistas, donning the latest in groundbreaking style, but Zeenie Dollz stand for much more. Each doll also highlights an environmental cause that needs attention, bringing together education and green ideals for young girls. Zennia, the special edition doll in the series, leads the pack and embodies Mother Earth, the protector of our planet. As the giver and sustainer of life on earth, Zennia is passionate about combating the evil anti-environment villains that threaten to destroy the world. The super heroes for girls!! The website also offers fun interactive games for kids! Click on the different Zeenie girls for a variety of fun activities. Part of the proceeds go to environmental preservation. I love how you put "The superhero for girls". This is really great that girls can think of something worthwhile instead of just picking a doll because it's cute or ditzy. They have something they can stand up for and it's a splendid cause! 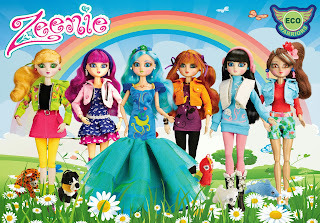 I really like this superhero dolls for the environment, THey are very pretty and unique and there is one for different areas of the earth to save including - recycling, water, air and I like the zeenie superpower to protect these environments. these are very pretty. These are such cute dolls and they represent a good cause! I love that some of the proceeds go to environmental protection! These are really cute. My niece would be a happy kiddo to have one of them. I love that each girl has a good mission. That is really neat! what a great idea, cute dolls educating our children on environmental awareness/issues. The tiny animals that come with them are pretty irresistible.